All the guards are now in stock and immediate delivery is guaranteed. For up country deliveries please send data on the freight company. I can furnish payment details. Then on receipt of confirmation that payment has been made at the bank I send your order. I can offer each of my customers my unique design based on the info you get to me; this can be photos, drawings, colour palette or shape preferences. The price of the proyect depend on the complexity of the work. Sizes go up to a maximun of 95 x 38 cm. You can place them inside a smaller structure or join different panels with silicone. 1Can I order a tile colour that is not included in the catalogue? Yes, there are many colours besides the ones in stock. 2 What is the largest panel size I can order? Rectangular: 38 x 95 cm = 15 x 37,4 inches. Square: 38 x 38 cm = 15 x 15 inches. 3 Can they be applied to the floor? Yes, vitrofusion glass is very resistant. 4What is the delivery term? 5How do you deliver to other cities? Shipping is performed with the freight indicated by customer and payment is made through a current account deposit. 6Can it be applied to partition walls? Yes, you can order special tiles in large measures and apply them to window frames or partition walls with silicon. 7Can you see through large glass panels? No, the texture allows for letting light through but the panel is not see-through. The glass can also be polished with emery once the vitrofusion has been done. 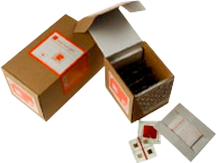 Each box includes The tiles series, and instruction manual and aplication gloves. Aplication: The tiles can be stuck on with silicon, on latex, ceramics, concrete, wood, etc. Although the tiles are transparent, their appearence will not change after being applied on a surface. They can be combined with other architectural aplication using cement adhesives and inserted in smooth concrete floors.